During the summer of 2018, members of ecology, evolution and organismal biology co-instructed an intensive 17-day field course on island forest ecology in the Mariana Islands. Comprised of undergraduates and graduate students, foresters, and environmental professionals, the participants hailed from throughout Micronesia. 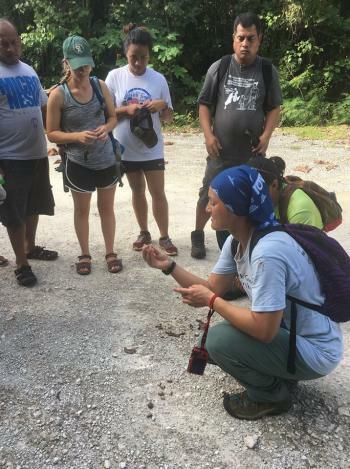 Funded by the U.S. Forest Service, the course instructors included Dr. Rogers, Dr. Ross Miller from the University of Guam, ISU post-doc Evan Fricke, and ISU PhD student Ann Marie Gawel. Many agency professionals and educators from Guam and Saipan also gave lectures or led field trips. Instructors highlighted the management issues facing the forests of Micronesia. They also elaborated on the ecology and natural history of plants, insects, and birds on the islands. The instructors showed how climate, habitat destruction, and invasive species can alter species interactions. The first half of the course took place in Saipan, in the Commonwealth of the Northern Mariana Islands, before moving to Guam. Rogers has been looking at the ecological differences between forests in Guam, which lost its birds due to the invasive brown treesnake, and forests in nearby island which still retain their native birds. Participants discussed some of the ecological differences that she and colleagues have investigated. The most significant learning experience for the students came from the group projects. Participants worked in small groups to design and conduct research projects comparing some aspect of ecology between the islands of Guam and Saipan. The projects covered topics ranging from bird-driven trophic cascades to invasive vine ecology. Gawel mentored a group comparing land snail populations between the islands. “The snail group had one student finishing their Associates degree at Northern Marianas College college and three professionals more advanced in their careers. Their variety of skills and perspectives really worked in a complementary way, and we all learned so much from each other," said Gawel. Teams presented their results at a public forum at the University of Guam. Participants were eager to share their experiences in their home islands and to continue to build on the inter-island connections they established or strengthened through their time in this course.